Shane van Gisbergen has upped the drifting ante by hurling a V8 Supercar around Sydney Motorsport Park. At Night. ON A LIST of awesome promos by Australian racing teams, Triple Eight Racing has shot straight to the top by building a legitimate V8 Supercar drift car. The recipe is delightfully simple. Take one V8 Supercar raced by Jamie Whincup earlier in this year’s championship, add quadruple the steering lock, dual brake callipers at the rear, flared wheel arches and a hydraulic handbrake, then throw Shane van Gisbergen behind the wheel and film the resulting smokefest. Van Gisbergen has a strong drifting background, competing in pro competitions outside his more traditional racing duties, and has earned a global reputation for his sideways race celebrations in Supercars. But the Kiwi has always complained about a lack of steering lock in the V8 Supercar when it comes to the sideway action. This new project, which was headed up by Triple Eight’s Team Manager Mark Dutton, seems to solve that problem, with custom steering arms resulting in 60-degrees of steering angle. Impressive when you consider a V8 Supercar usually only has 15-degrees. 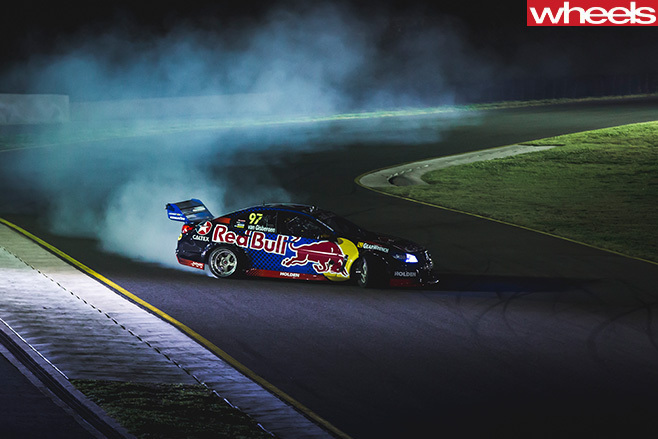 With van Gisbergen behind the wheel, the V8 Superdrifter is a serious smoke weapon and allows the 27-year-old to chuck the car into corners at obscene angles. 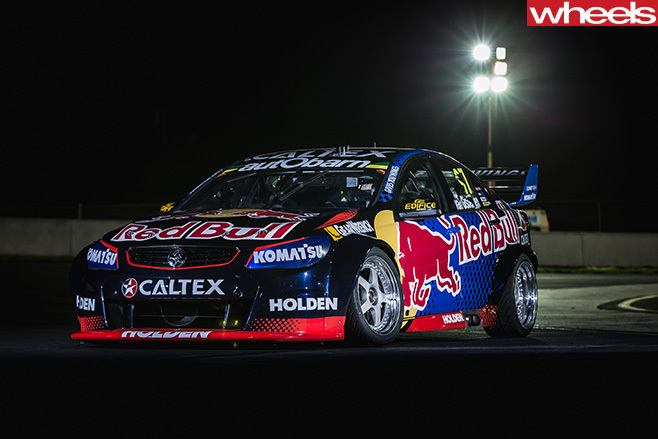 Packing over 470kW, the V8 Supercar is more than capable of transforming rubber into smoke in spectacular fashion. “It was an awesome thing to be a part of,” said Van Gisbergen.